The Hard Thing About Hard Things is a pragmatic and entirely refreshing take on business and leadership. It’s one of the most useful–if not the most useful–business books I’ve read in ages. Easy to read and straight-talking, Horowitz provides actionable, insightful advice backed with real stories about the issues that matter most to him. It’s obvious that Horowitz has a distaste for big corporations–not surprising given his Silicon Valley pedigree. And, let’s be real, there’s a lot not to like about the politics and ways of working in some oversized, complex cultures. His prescriptions for building a business are largely about how to avoid the ugly parts of big corporate culture such as building a culture of equity and merit over politics, taking responsibility as a leader over abdicating it and screening for ambition for the team and business over ambition for oneself. There is SO MUCH to love about this book. 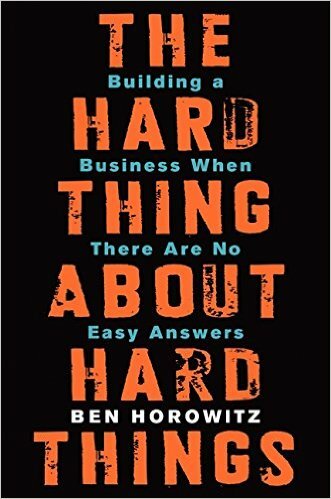 And SO MUCH to admire about Ben Horowitz. Overall, The Hard Thing About Hard Things is a wonderful book that EVERY employee and/or leader working in or building a business can benefit from. Regardless of the size of the organization, at some level, we’re all the same. We all want to know that we’re valued, that raises and promotions are based on merit, that we’ll be given opportunities to grow and shine, and that we’re working with straight-talking, straight-shooting people we can trust and respect every day. Implementing the advice in this book is the closest thing I’ve seen that’ll get ya there. Kudos, Mr. Horowitz.